Dr. Lawrence Sutherland served as Director of Bands and Professor of Music at California State University, Fresno from 1969 until 2006. He earned his Bachelor of Science degree in Music Education from the University of Tulsa and his Master of Arts degree in Music Theory from the University of Missouri. His Doctor of Musical Arts degree in conducting was the first to be awarded by the University of Arizona. Dr. Sutherland has performing credits as a trombone/euphonium player with the St. Louis Symphony, Kansas City Philharmonic Orchestra, Tulsa Philharmonic Orchestra, Tucson Symphony, Fresno Philharmonic and the Tommy Dorsey, Ralph Marterie, Richard Maltby and Woody Herman bands. Dr. Sutherland’s duties at CSUF included conducting the Wind Ensemble and teaching classes in conducting, score study, and trombone/euphonium performance. He conducted the University Orchestra in the spring of 2007. In addition to these duties, he has served as Music Director and Conductor of the Tulare County Symphony Orchestra and as Interim Music Director and Associate Conductor of the Fresno Philharmonic Orchestra. Dr. Sutherland has served as guest conductor and adjudicator throughout the United States, Alaska, Canada, Europe, New Zealand, England, the Philippines, Australia, Korea, Singapore, China and Japan. 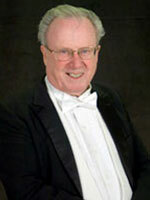 Dr. Sutherland conducted the UCLA Wind Ensemble during the 2012-13 school year. Dr Sutherland has served as an adjudicator for World Projects Productions in England and Australia and is currently Artistic Director for World Projects’ International Band and Orchestra Festivals at Carnegie Hall in New York and Disney Hall in Los Angeles. He is past President of the Western Division of the College Band Directors’ National Association. In 1976 he was voted into membership of the American Bandmasters’ Association. He served as the Western Coordinator of the National Association of Jazz Educators for eight years, and Southern Section President of the California unit of the International Association of Jazz Educators. In March of 2010 he was inducted into the California Alliance for Jazz Hall of Fame. Dr Sutherland founded the unique Western States Collegiate Wind Band Festival, now in it’s 33rd year. In 1999, Dr. Sutherland was voted the Outstanding California Music Educator, and also received the Byron Hoyt Award from the California Music Educators Association. The California Band Directors Association presented Dr. Sutherland with their Outstanding Lifetime Achievement Award in February, 2000. In 2011, CMEA presented Dr Sutherland with the Aubrey Penman Retired Music Educator award. Dr. Sutherland is the only person to have directed all three California Music Educators All-State instrumental honor groups—Orchestra, Symphonic Band and Jazz Band. He has conducted the SCSBOA All-Southern High School Band twice and has been a 4 time conductor of the CBDA All State Band. He has conducted the California Community College Northern Section Honor Band 4 times and the Southern Section twice, as well as the All-Northern California Honor Band and the Northern California Honor Band. Dr. Sutherland was the organizer and Chief Conductor of the California State University Select Wind Orchestra, performing for the 9th Meeting of the World Association of Symphonic Bands and Ensembles in San Luis Obispo, CA, in July of 1999. The CSU, Fresno Wind Ensemble, under his direction, received virtually every honor a university band can be awarded. They made their Carnegie Hall debut in June of 1996. They performed, by invitation, for the World Association of Symphonic Bands and Ensembles in Belgium, the All-Japan Band Directors Conference in Nemu-No-Sato, audiences in Shanghai and Beijing, the College Band Directors National Association Conference at UC Berkeley, the California State Band Directors’ Conference, and the Music Educators National Conference. They performed for the American Bandmasters Association conferences in Tempe and Las Vegas. In addition, they participated in many state and regional MENC, CBDNA, CMEA and CBDA conferences. The CSUF Wind Ensemble has commissioned works from Claude Smith, Philip Wilby, Robert Gerster, Jerome Sorsek, James Sochinski, Zdenek Lukas, and Jack Fortner. The Wind Ensemble is featured, along with Black Dyke Mills Band, on a CD of the wind works of the English composer Philip Wilby on Doyen Records.